April Update: Announcing New Locations! We're so grateful to have a home in these markets and we'd love to keep the momentum going! If there are other locations where you'd like to see Tombo Toffee, please let me know. In the meantime, please shop these markets and support all of the local farmers, producers and makers around the Bay. On April 27-28, 2018 we'll be selling our toffee at the annual Heart of the Home Tour in support of the Children's Support League of the East Bay. We'll be at the Piedmont Community Center from 10 a.m. - 4 p.m. on both days, along with a variety of other vendors. CSL is an all-volunteer organization that raises funds mostly through the Heart of the Home Tour to support a variety of non-profit agencies that benefit disadvantaged children, newborn to age 18, in Alameda and Contra Costa counties. Its purpose is exclusively charitable, and over 90% of the money raised on the Tour goes directly to these agencies. For more information, here's a link to the event FAQs. I'd love to see you there! At last month's Chocolate Salon in San Francisco we featured our No. 8 - Bourbon toffee for the first time. And for the first time I was asked the question, "Is the bourbon you use gluten free?" I'll admit it never crossed my mind that it wouldn't be, but since then I've realized it's actually a very good question. And a tricky one to answer. As a starting point, the discussion boards on www.celiac.com are filled with posts from people who have found a way to happily enjoy bourbon in their lives. It's filled equally with those who can't tolerate a single shot and suffer the consequences. I also found a "Gluten Free Whiskey List" posted on www.urbantastebud.com that I thought was golden but alas, alongside some of the brands is a notation that says "don't drink if allergic to gluten." Um, say what? The best article I found is from www.verywell.com. It explains, in the simplest terms, that even though gluten proteins from grains including wheat, barley and rye, are removed during the distillation process, traces may still remain in the final product. I reached out to the makers of Bulleit bourbon, the brand we use in our toffee, and here's what their Director of Consumer Care, North America told me: "Bulleit Bourbon has NOT been verified to be gluten free nor do we claim it to be gluten free. If you have any concerns related to consuming this product, we suggest that you speak with a doctor." So, is bourbon gluten free? My best answer is a solid "it depends." But I can now clearly say that our Bourbon toffee is not, at least for the moment. Toffee is such a treat for people with gluten intolerance my quest to find a high quality, gluten free bourbon has begun. I might need a cocktail for this. At the 2018 San Francisco Chocolate Salon on Sunday, March 11, 2018, Tombo Toffee was named "Top Toffee" by Salon judges. The company earned its second Gold medal rating at this Salon, coming on the heels of its first Top Toffee rating at the Fall/Holiday event in November 2017. Tombo Toffee also earned a Silver award as the "People's Choice" for Top Toffee at the March Salon. The International Chocolate Salon Awards for the Best Chocolatiers and Confectioners in America are based on the combined total number of Gold and Silver Awards received by each entrant in the previous year's TasteTV Chocolate Salons in San Francisco, Los Angeles, Seattle, Sacramento, and Fall (SF), as well as in the standalone Chocolate Salon Award Competitions for Best Caramels, Toffees, Bars, Truffles, White Chocolate, Best Hot Cocoa and Drinking Chocolate, Vegan Chocolates, Spicy Chocolates, Top Design and Branding, and Best Bridal Chocolates. NEW LOCATION: Market Hall Foods on 4th! This Saturday, February 10th from 1-4 p.m. we'll be at Market Hall Foods on 4th in Berkeley in celebration of chocolate! Sample some of our most popular flavors and pick up a bag or two for the special Valentine in your life. We'd love to see you there! Stay tuned for more updates on new locations where you can find Tombo Toffee. We had a very successful showing at last month's Good Food Mercantile in San Francisco and have exciting news on the horizon! In honor of my son's 11th birthday today, this month's recipe is from his favorite food group: donuts! Instead of making or buying a traditional birthday cake, I served these round beauties stacked high on a cake stand, complete with a simple glaze that made them sweet but not overly so. The glaze also acted a bit like glue and held the stack together nicely. I know it was his birthday, but I got a present, too, when his eyes got big and his face lit up when I showed him the final result. Note to self: Donut cake = serious mom points. The recipe I used happens to be from King Arthur Flour and isn't intended to be an endorsement. I found this recipe easy to follow and these cake donuts are faster to make than those that require yeast. I made two batches, one vanilla and one chocolate. To make the chocolate donuts, I simply replaced 1/3 cup of the flour in the recipe with 1/3 cup of unsweetened cocoa powder, and it worked great. I used a small/medium sized donut pan but with Valentine's Day right around the corner, consider making heart-shaped donuts or experiment with other fun shapes. Whoever you make them for, I'm sure their face will light up, too! Our Holiday 2017 flavor is here: Pumpkin Spice! 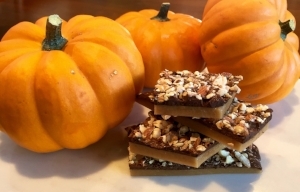 For the second year we're featuring our Pumpkin Spice toffee for the holiday season. We use the beautifully aromatic Pumpkin Pie Spice blend from Oaktown Spice Shop to add a distinct and warming flavorto our toffee. We can't think of a better way to get through the hectic weeks ahead! Currently available at Village Market in Oakland and in our online Shop, our Pumpkin Spice toffee is available now through January 5, 2018. Wishing you all a delightful November. Join us November 19th at the Fall/Holiday Chocolate Salon in San Francisco! Sample 3-4 flavors and learn about our holiday specials! For more information and to purchase tickets, visit www.fallchcolatesalon.com. Pumpkin is an amazing ingredient I love to enjoy throughout the year. I first developed this recipe when I hosted my own food & recipe blog a few years ago, and it's still one of my favorites. My 10 year old son also loves these muffins - just the right amount of sweetness to keep him happy, with all the nutritious benefits of pumpkin. This recipe makes about 18 average-sized muffins. - Nearly one 15 oz. can of pure pumpkin puree. - Preheat your oven to 400. Spray the muffin pan liberally with cooking spray to prevent sticking. - Gently melt the butter in a saucepan or microwave and let cool. - In a large bowl whisk together the flour, baking powder, baking soda, spices and salt. Add the chocolate chips to coat and set aside. - In a separate bowl, whisk together the brown sugar, vanilla and butter, making sure to smooth out any lumps. Add the pumpkin and combine. Add the eggs and yogurt and combine (adding these at the ends makes sure the eggs won't scramble in case your butter is still warm). - Add the pumpkin mixture to the dry ingredients and stir until just combined. - Divide the batter among the muffin cups using two pans or banking in two batches if necessary. Bake until a toothpick comes out clean, approximately 16-18 minutes. Sugar and spice and everything nice...that's what our toffee is made of. The International Chocolate Salon recently announced its 2017 Spicy Chocolate Awards Competition finalists and we’re thrilled to be recognized! - One of two chocolates to receive an overall 4.5 stars rating! You can read the complete announcement here: http://www.internationalchocolatesalon.com/finalists-announced-for-spicy-chocolate-awards-2017/. Happy World Chocolate Day! What better day to announce that Tombo Toffee has been selected among the best in The International Chocolate Salon 2016 Top Artisan Toffee Awards! - I'd never tasted Tombo Toffee and this Oakland newcomer (new to me) has quickly become a favorite! Great texture, delicious flavor, a real freshness. Love the logo and packaging. Hard to eat just one piece. Yum! - Tombo Toffees (all varieties) had the perfect texture - crunch, then chewy. - Like the Tombo everything, the taste and the looks. - Tombo Toffee No. 2 Cayenne was a surprise, with a nice chili flavor that wasn't overpowering, providing a unique taste with the sweet toffee that had a nice texture. Last Wednesday evening we had the chance to participate in our first ever pop-up sales event at Kitchener Oakland. We had a blast! We gave away 125 free, single-piece samples and sold small bags of our Rosemary, Fennel, Cayenne, Lavender and Almond toffee. We were thrilled to share the night with some of our other Kitchener family members including Natty Cakes, The Lumpia Company, Port City Baking, The Pie Shop, Shades of Sugar Bakeshop and Pinx Catering. I also want to sincerely thank all of my friends who took time out of their busy schedules to come by and offer their support. It was incredibly generous and it meant the world. Being able to share the event with some of the people who've been there from Day 1 made an awesome night that much more special. Tomorrow night is the annual fundraising auction at my son's school, Bentley. I'm excited and proud to be offering a 'toffee of the month' donation that will hopefully raise funds to support the ongoing professional development for the teachers at the school. This is the first donation of this kind that I'm making and hopefully not the last! Please email us at Tombo Toffee if you'd like a similar donation made to help raise essential funds for your school or organization. We're more than happy to help! *UPDATE: I'm thrilled to report that our toffee sold at the auction for nearly twice as much as it's value! We appreciate everyone who participated and especially want to thank our winning bidder!